Chicago is a favorite travel destination in the United States. It has excellent restaurants, a great night life, and many different cultural opportunities. There is no shortage of world class museums. There are also plenty of sporting and music venues around town, so whatever your interest, you won't have to travel far. There are many professional conventions that are hosted in Chicago every year. This also means there is no shortage of hotels, particularly those that are equipped for business travelers and large meetings. Hotels are generally concentrated around O'Hare Airport and the downtown area near the Magnificent Mile. If you're planning on exploring the city, downtown Chicago is where you want to be. There are also many interesting neighborhoods outside of the downtown area, but many are easy to reach with public transportation. This boutique hotel is located very close to the Magnificent Mile and is walking distance to the Arts Club of Chicago, the Tribune Tower, and the Chicago Water Tower. It's designed with a modern simplistic style and is a luxury hotel that accommodates to all types of travelers. Families are welcome. There are many amenities available to guests including in-room massages, a roof top bar, and a sky terrace. The hotel has 63 guestrooms which have complimentary wireless internet, desks, in-room minibars, video game consoles, and blackout drapes. There are also two on site restaurants that are available to guests. This hotel offers modern luxury in an ideal locations so that you can fully experience city life. This hotel offers guests luxury accommodation with a contemporary style. The friendly staff go out of their way to welcome you to Chicago and you are sure to be comfortable in the well furnished rooms. There is a complimentary breakfast served every morning on each floor. There's also complimentary high speed internet and a Manager's Reception with hors d'oeuvres and cocktails every evening. Room service is available to guests as well. Guests can also enjoy the full service fitness and business centers. Each room is equipped with a refrigerator and microwaves are available on request. Regardless of your purpose for visiting Chicago, you are sure to feel at home in the Kinzie Hotel. 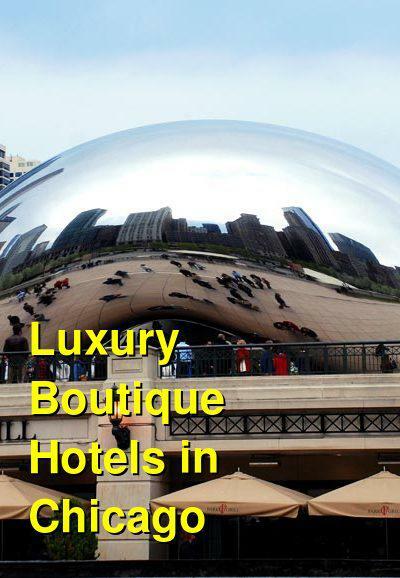 Located in downtown Chicago, this boutique hotel is only a block from Michigan Avenue and just a short walk from the John Hancock Building. It offers amenities for vacationers and business travelers alike. There's an on site business center that includes a fax machine, photocopy and print services and more. There's also a large exercise center with a wide range of equipment. If you're hoping to pamper yourself you can take advantage of the spa treatment rooms which offer facials and massage therapies. There are also in room restorative treatments available. The on site restaurant, David Burke's Primehouse, is a favorite of visitors and locals alike. It's a Chicago style steakhouse that serves Kentucky Creekstone Farms beef that has been dry aged with Himalayan salt bricks. The guestrooms are comfortable and well furnished. They are decorated with commissioned art from both locally and nationally recognized artists. This hotel offers guests a unique experience as a lifestyle boutique hotel alternative. It has a high tech atmosphere and a focus on design. Although it's a hip new hotel, it is still very down to earth and approachable. The hotel is located in the River North District to the north of the downtown business core. It's about two blocks from the Magnificent Mile and one mile from Millennium Park. It's also just a block from a CTA station. There are many amenities available to guests including a spa, fitness center, business center, and laundry facilities. There are 130 guestrooms and suites that each have wireless internet access. This is a great hotel for anybody who is looking for somewhere fun and eclectic to stay. 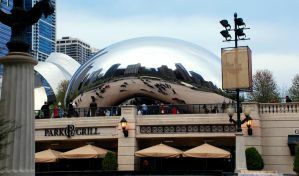 It has a great atmosphere and a fun vibe that will help jumpstart your time in Chicago. Located near some of the city's best shopping, entertainment venues, and restaurants, this boutique hotel is right in the heart of downtown Chicago. There is also meeting space available for events, luxury guestrooms, and many unique amenities available to guests. Guests also receive VIP access to the nearby House of Blues. Rooms are equipped with high definition televisions, fully stocked minibars, desks, and high quality furnishings. You're sure to be comfortable and in the middle of the action at this state of the art hotel.